We are conveniently located 10 miles south of Boone on Hwy. 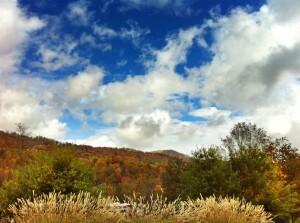 105 or 7 miles north of Linville on Hwy. 105. You’ll find the High Country of N.C. offers many activities for everyone in the family! **Golfers can try the challenging Hawksnest course, Hound Ears (nationally recognized champion course), the Sugar Mountain course or the Boone Golf Club. **In Boone you will find mini-golf, go-carts, swimming pools; at Banner Elk you can go horseback riding, or get free transportation at our entrance for whitewater rafting, kayaking and canoeing. **Be sure to ask about our special events. The annual Gathering of the Clans at Grandfather Mountain is something you won’t find everywhere. Please avoid Holloway Mountain Road if coming from Blowing Rock. Just stay on 321 to Boone and take Hwy 105 South to us.